There are many flashy ecommerce platforms out there that all brag about their superiority. How to know which is truly best? More appropriately, which is the best fit for your business and what you want to accomplish. I consult with new ecommerce stores every week on many different platforms. 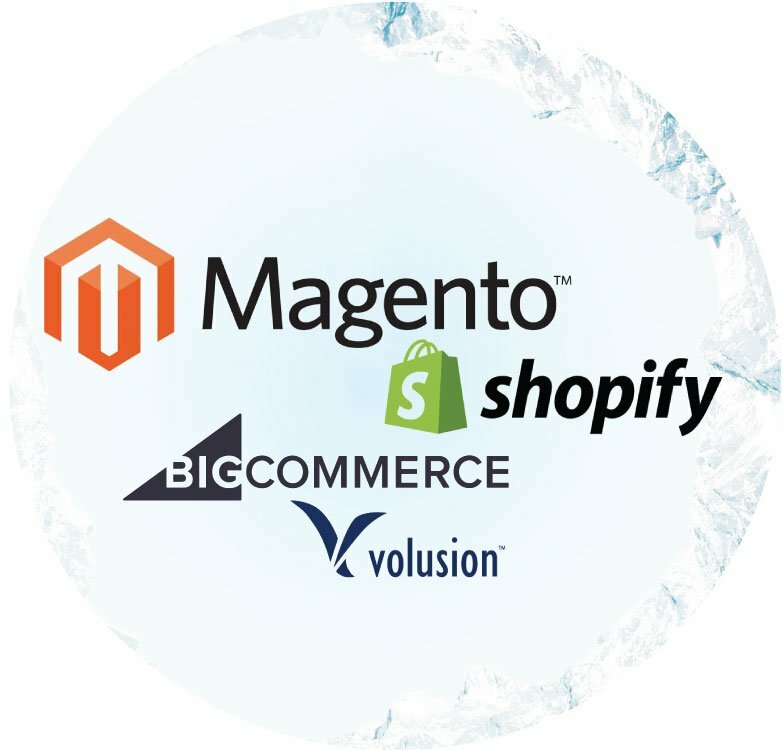 My experience over the last 10 years has often pointed me toward Magento, Big Commerce and Volusion. I'm only reviewing key decision making features of each cart. The best match will weigh heavily on your current ecommerce skillset, budget and product catalog. Keep in mind the feature sets of these platforms are ever changing so before making a decision please visit each provider's website for current info. I've also included a Cart Comparison Matrix for quick review at the end of this article. Volusion has all the standard features of an entry level cart and is a great solution for beginner to intermediate merchants on a budget. Volusion hosts the site for you and their team will do a lot of the setup and hand-holding for beginners if you need it. While you can do a lot with this platform, I don't recommend it for experienced ecommerce entrepreneurs doing 10m+. If you are doing 10m+ you'll want to check out their Enterprise (EE) offering called Mozu or the other solutions mentioned here (Magento or Big Commerce). Volusion has a great search feature right out of the box which is worthy of note. It's intuitive for customers and it just works. When you outgrow it you can always upgrade to Nextopia Search which is easily integrated for a monthly fee. Something unique about this platform is the robust built-in CRM. Neither Magento nor Big Commerce have this built in. The Volusion CRM ties emails from customers directly to their orders and customer account with links. This is one of the highlights of this platform for me and can streamline customer service significantly. Typically, you'll pay $25-$60 per user for Zendesk or other CRM solutions and the integration will vary. Volusion also has a basic affiliate marketing system built in. You can automatically issue bloggers and affiliate websites referral links for a revenue share/commission (you set the rate). I have personally used this system to increase backlinks and generate excitement in my early days of ecommerce. This little affiliate system can be a powerful tool in the right hands and it works like it's supposed to. Big Commerce (BC) is a great starting point for new online retailers as it is scalable and offers an upgrade to full Enterprise level features. It's a hosted service (like Volusion), and you can start out around $80 with a decent entry level package and jump up to their Enterprise custom solution when you're ready. This platform is the poor man's Magento and has much more flexibility than Volusion. The Enterprise version can be expanded to advanced customizations if needed. BC is a low liability implementation since it's completely hosted by BC (unlike Magento). Big Commerce will customize the Enterprise site exactly how you want it including graphics and feature set. There is a big advantage to having the host do the implementation. It lessens the liability of conflict from different developers/extensions on the site and BC also knows their code well since that's all they work on. BC will also help you with full migration from your current platform and general marketing direction which is great for beginners. Big Commerce has all the standard features of an intermediate platform out of the box. BC Features a built-in blog which notably Volusion does not. With content marketing so huge now and everyone trying to appease "the google", an integrated blog is more important than ever. BC has this baked in. On the other hand, no matter what you do, Volusion won't allow a blog on their server as it is a security risk. Magento will host a blog internally using extensions including integrated WordPress options. Although Ebay is typically an ancillary market for most, it can certainly add to your market share and presence, especially if it's integrated and easy to manage. Big Commerce has Alibaba integration which is interesting, I haven't played with this yet but could be advantageous depending on your product category. The reporting in Big Commerce and Volusion are pretty good overall. Strangely Magento reporting is awful in comparison. BC offers a great built-in Abandoned Cart Email tool which is easy to configure, Magento has one but it's a nightmare to setup and Volusion requires a 3rd party to set one up for a handsome monthly fee. BC has a really inexpensive $29.95/mo entry level price with a 1.5% revenue share which really is a pretty great deal. This is a great option for new sellers on a budget that don't want the liability of a huge site build and the liability that comes with it. You can upgrade to the PLUS package for $79.95/mo with more features and no revenue share. Shopify is a terrific platform for new online retailers that don't need a lot of customization. There are a wide variety of apps for this platform but in the past, they've fallen short with advanced features. They market to the small brick and mortar shop owner that wants to sell online. It's quite a good match for that type of business. For online retailers that want to have elite market advantages, Shopify will fall short. Shopify and Shopify Plus are both hosted solutions. This means Shopify hosts your website and takes care of updates. Magento CE and EE, on the other hand, are both self-hosted solutions. That means as a Magento store owner, you are responsible for hosting, updates and yes, when your website crashes you are responsible for it. See Magento section below for more on this. Shopify does basic app integrations with shipping solutions like Shipstation or Countdown Timer's like Amazon are available and work well. There are also some really cool personalization type apps like PrintFul or Teelaunch. Keep in mind many of the more serious apps come with a monthly cost and are still limited to their initial feature-set. Meaning, any customizations or improvements, feature requests…yeah, those are going to be extremely expensive if the developer will even entertain the idea. I asked a Shopify rep about customization for a client site and customizing some apps. They said that for even the basic customizations I requested we'd have to use Shopify Plus which is a whole wildly different beast. Shopify, in general, is only $29-$299 (as of Jan 2017) plus the transaction fee if you're using a 3rd party payment gateway. That's actually a great value in general for many small startups. Shopify Plus starts at around $15000/year or more. That doesn't include all the work for the customizations a serious eCommerce store needs to have a clear market advantage. A typical Shopify Plus with customized functionality and template will run you about $30-$60k+. The biggest difference between Shopify Plus and Magento EE is the flexibility in the back end. Magento EE is incredibly modular and the website manager has impressive access to most of it. This also allows the website manager to get into serious trouble if not properly trained. Shopify has some very cool for small brick and mortar looking to get online, build in POS. Before you get too excited, realize you'll pay a small surcharge to charge cards through Shopify but it's typically worth it. Having the Omni-Channel integration is a key element and keeping things integrated and simple has its advantages. Magento is one of the premiere ecommerce platforms and…it's free! But here's the rub, Magento is a self-hosted solution so you have to pay for your own hosting and CE (Community Edition Version) has limited features. In general, Magento is the most robust platform on the market in all regards but it's difficult to implement properly. I would only recommend this platform to intermediate or advanced merchants that agree to hire a specialized Magento development partner and host. If you attempt to set this up yourself and hack it together, you will waste years of your life you'll never get back. Getting some (expensive) professional help with Magento setup is absolutely required and can exponentially increase your speed to market and success. All said, Magento is a powerhouse in the right hands. This is especially true with hobbyist e-commerce entrepreneur's experimenting with the CE version. This has resulted in many misleading reviews that Magento is slow, this is 99% due to novice setup, poor implementation, and inadequate hosting. Please note: In the wrong hands Magento can destroy an otherwise healthy business, I've witnessed this happen and it's not pretty. In my first e-commerce venture www.paradisefibers.com, we used Magento Enterprise and watched a respected competitor of ours attempt to switch their .asp site to Magento with their in-house .asp developer team. I've personally watched companies double their net profit YOY after switching to a well-designed Magento EE website build. In Magento, you can set up what are called Attribute Sets. This feature makes Magento stand out for merchants with large catalogs. Setting up Attribute sets for each product type allows your store to offer increased relevancy throughout the customer browsing experience. For example, computers would have custom fields like (RAM, hard drive size, processor) and Camera's would have custom fields like (Lens, battery life, Megapixels). These fields, when filled out properly are presented in the filters when shopping and also on the product page as specifications. Having this information in place provides efficient catalog structure and improves the customer experience and conversions. The new online merchandiser in EE is a robust way to arrange items in categories. This functionality is like featured items on steroids allowing preferential placement of items within categories manually and based on rules. Magento also has a unique multi-store hosting feature which allows multiple e-commerce stores that can share inventory listings on one installation of Magento. This can be very useful if your store sells wholesale and retail and shares the same product data or if you simply want to have multiple retail stores that are marketed differently. You can also easily toggle what specs/attributes are displayed on product pages which is something BC or Volusion can't touch. Another unique feature to Magento is the ability to segment customers. Magento can show your customers banners, send them emails, offer them coupons and more based on many customer behavior rules. This feature can be very powerful with large customer bases and traffic volume but isn't as relevant for small budget startups initially. Looking for a turnkey template for Magento EE? You are out of luck. There are many robust templates for CE but not for EE, it's weird. Apparently, Magento expects EE users to completely start from scratch when building their site and that's pretty much what you have to do. A new installation of Magento EE needs a lot of configuration to even start presenting catalog listings. How do I find a good quality host for Magento? Finding a quality partner to navigate the perilous waters of Magento is tricky. You will need an experienced, high-quality development team and hosting company. That said, like any robust tool, Magento has a surprisingly high cost of ownership. Even for the free CE version, you need good hosting starting at around $200/mo and EE is around $650/mo. Premium Article "5 Ways Your eCommerce Is Leaking Money"
Ever wonder if your eCommerce store is optimized 100%? Chances are it's not. Here is a premium article with some great timeless eCommerce tips that will make you money now.